Extreme summer heat has been increasing over the United States over the past century. 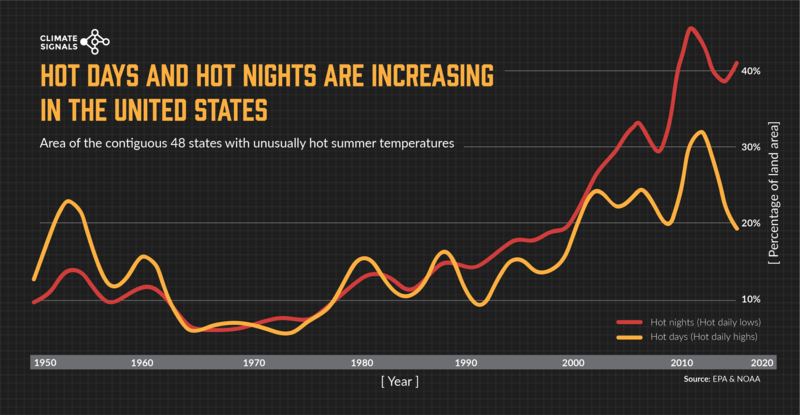 The trend is particularly clear since 1985, and the trend toward hotter nights is particularly strong. See figure above illustrating NOAA data provided by the U.S. EPA here. Hot nights are a classic signature of climate change on warming planet as the influence of global warming is particularly strong in elevating overnight temperatures. The impact of hot nights is especially important as elevated overnight temperatures do not permit any respite from the heat, respite that is critically important for children, the elderly and the ill.
High humidity is another trend driven by climate change, creating a double whammy. This trend particularly important as high humidity drives up the heat stress index dramatically. The fingerprint of global warming has been found in the global increase in heatwaves. Climate change has been found to increase the global frequency, severity and duration of heatwaves. In the western United States the increasing heat is already so severe that the signal of climate change has been detected rising above the wide range in natural variation in temperatures seen at the local level (the range in natural variation is greater at the local level than the global scale). In the eastern U.S, an attribution study has already identified the fingerprint of climate change on extreme heat in the Northeast and North Central U.S.. The signal of climate change can be seen when heatwaves are especially severe or record-breaking, when they lasting longer than usual, when they appear unusually early or late in the season, and when a heatwave bring the total number of hotter-than-normal days in the year to date above the long-term average for the year to date. While the long-term trend of increasing heat is driven by increasing concentrations of greenhouse gases in the atmosphere, other human activities played a role in short-term spikes and slumps in 20th century temperatures. Notably, the spike of hot summer temperatures in the 1930s largely represent the extreme heat of the Dust Bowl era. That heat was driven by large-scale land mismanagement in the Great Plains that resulted in dust-bowl conditions and the loss of surface moisture which would have otherwise provided evaporative cooling. From the early 1950s to the mid-1970s, anthropogenic aerosol forcing (e.g. light-reflecting sulfur pollution from coal-fired power plants) reduced reduced summer temperatures in the Northeast and Southeast and agricultural intensification may have suppressed the hottest extremes in the Midwest through evaporative cooling via irrigation. For more detail on the anthropogenic factors that drove short-term spikes and slumps in US temperatures over the 20th century, see Chapter Six of the 2017 U.S. National Climate Assessment.